For more than 15 years, people who grew up in dysfunctional families have found hope, healing, and the power to move forward with their lives in the classic Forgiving Our Parents, Forgiving Ourselves. Now, in this revised and updated edition--which includes new stories, statistics, and more practical help--a new generation can move beyond failure to forgiveness by understanding the roots of their pain. Readers will explore family patterns that perpetuate dysfunction by constructing a "psychological family tree" that will uncover family secrets and habits that have shaped their adult identity. As they develop a greater understanding of their family of origin, they will be able to take the essential step of forgiveness, releasing themselves from the chains of the past to live in freedom and wholeness. Forgiving Our Parents, Forgiving Ourselves gives readers the power to become "unstuck" from behaviors that hurt themselves and those they love, changing their hearts so they can change their lives forever. 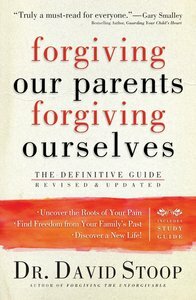 About "Forgiving Our Parents, Forgiving Ourselves"